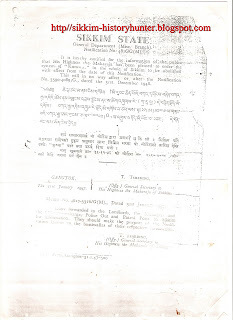 Sikkim State Notification for the abolition of Kuruwa. Literally ‘Kuruwa’ means a long wait in Nepali. Sometimes on account of the road condition and other factors, people sent to transport the Kalo Bhari waited for several days for the arrival of the commodities. The process of serving as a Kuruwa labour was very much similar with the process of Jharlangi. For this labour also the British Officials offered contracts to the local Kazis and Thikadars for the supply of the labourers. For such contracts the Kazi- Thikadars were handsomely paid. But, as a Kuruwa, a peasant had to work with out any wages. During the entire wait for the Kalo Bhari, the ryot himself had to manage his resources. No excuses of a ryot were granted by the Kazi-Thikadars. Under any circumstances the ryots had to discharge their duties as Kuruwa. There were few cases in the Western Sikkim, when their Zamindar had forced them to work as Kuruwa, when they were performing the death rites of their deceased family members. As a Kuruwa they had to carry Kalo Bhari from a far away distance. There were various centers from where the Sikkimese peasants as Kuruwa labourer had to carry their loads. Some of the important centers for this labour were, Geil Khola, 27th mile, Rangpo, Melli, Teesta etc. The British Indian Railway used to unload such loads at a place called Geil Khola in Darjeeling district of modern West Bengal. From there the distance of Gangtok is nearly 70 Kilo meters. The Kuruwa had to carry their load from such a long distance and that too at their own expense. The weights of the load varied from time to time and were entirely depended on the commodities sent by the British Government. But, generally the loads were of 40 kg. weight. If we compare British Imperialism in India with the native feudalism of Sikkim than one can notice Sikkimese feudal system was much tough and cruel. The Sikkimese feudalism became more severe and cruel after the interference of the British Government in the politics of Sikkim. In short, the responsibility for the introduction of feudalism in Sikkim also goes to the British. The Indians in the plains were directly exploited by the British authorities, who were foreigners and were concentrated in a profit making process. Of course, the pricks and pains which the Indian masses received from the colonial rule were also incomparable. But, the Sikkimese peasants were exploited by their own people, who behaved like “the very apt pupil of the British”. In Sikkimese feudalism we find the elements of French feudal system of the mid 18th century. There also the society was divided into three estates namely, the nobility, the clergy and the common people in Sikkimese society very similar kinds of elements are amply found. The only difference between the French feudalism and Sikkimese feudalism is that the peasants of France had to pay Thithe as religious tax, which was not to be paid by the Sikkimese peasants. Moreover, the story of a poor and destitute either he may belong to Sikkim or France is almost similar, as poverty and suffering does not have a common language, race, caste or even the boundaries. But, in every revolution, some signs, some symbols, comes to occupy a pre eminent position and those signs or symbols become the watchword for the masses. In Sikkim, people’s sufferings, their woes, trials and tribulations came to be symbolized by Kalo Bhari, Jharlangi, Theki Bheti, and Kuruwa. Such unlawful system was eliminated by the Notification from the Maharaja of Sikkim Sir Tashi Namgyal which is pasted here with this post. It was issued by the General Department (Misc. Branch) Gangtok on the 31st Day of January 1947. It bears a Notification No. 4816/G(M) and has a Memo No 4817-5316/G(M). The Notification states an immediate implementation of the Royal Order in the entire Kingdom. 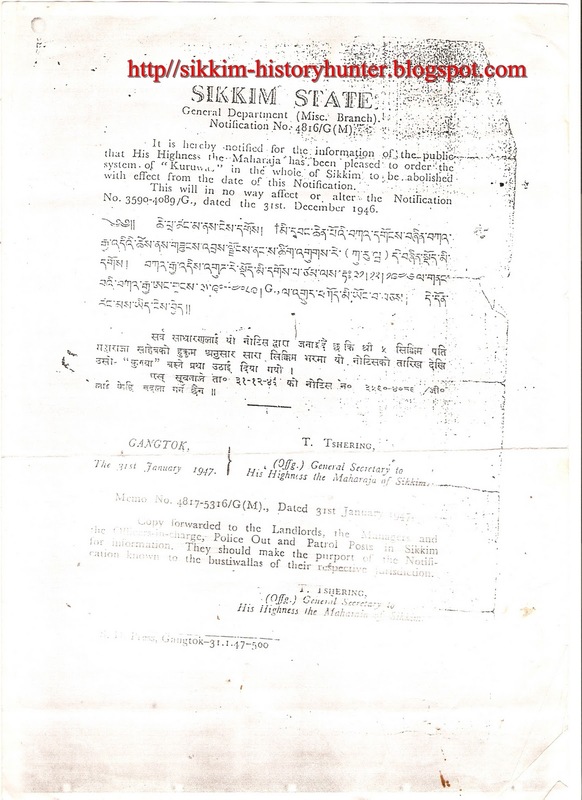 It was issued in three languages English, Tibetan and Nepali which were regarded as the prominent languages of the former Himalayan Kingdom of Sikkim. After the issue of the Notification from His Highness Maharaja Sir Tashi Namgyal Copies of the same were forwarded to the Landlords, Managers and Officer-in-Charge, Police Out and Patrol Posts in Sikkim for information. I am greatly obliged to Mr. Shital Pradhan a well known name in Sikkim History for sharing this extraordinary certificate with me. His help and support will lead me a long way in my days to come.